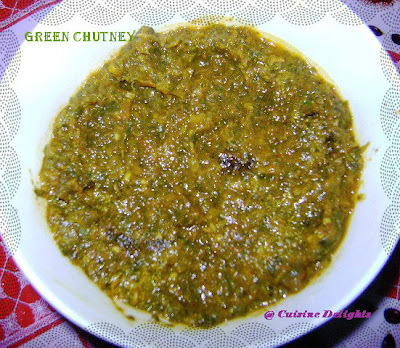 A green mint and coriander flavoured chutney which is great for sandwich spreads and chaat varieties. Mint adds freshness to this chutney. Green chutney is probably the most favourite Indian accompaniment. Crispy samosas, parathas, pakoras etc. are considered incomplete without this chutney. The chutney can be stored refrigerated for upto a week. Wash coriander and mint leaves nicely under running water.Drain and keep it aside. Grind the above ingredients to make the green paste. Squeeze juice of half a lemon and mix well.This is added to retain the green color. This chutney can be stored for 4-5 days in the refrigerator.